Hello friends! 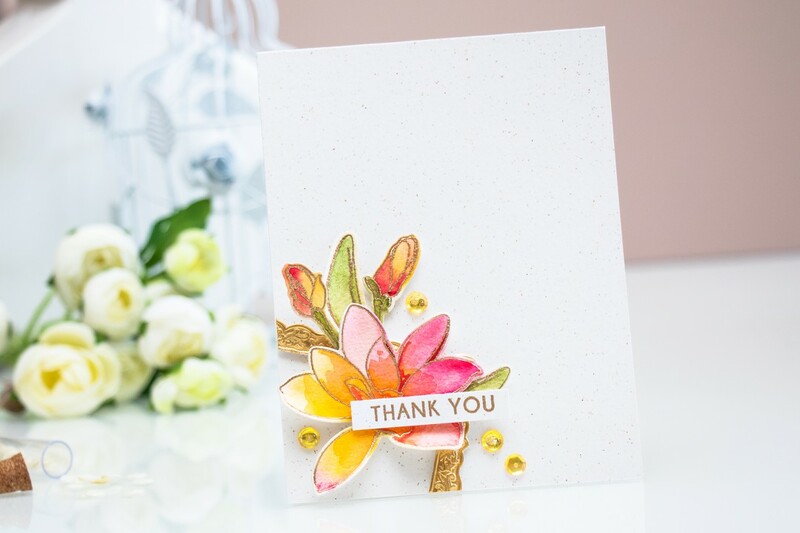 Do you ever color outside the lines of your stamped images? For a long time this used to be a big No for me, but after discovering watercolor I changed my mind. I still prefer to color just inside the lines when I’m using my alcohol markers, but when it comes to watercolor I think its okay to color outside too. Today I’m coloring magnolias using watercolors and I’m stepping outside the lines of my images. I’m using a wet on wet technique and blending pigments directly on the wet image to create new colors and new shades. I started by heat embossing Magnolia images in Brass embossing powder onto Arches Cold Press Watercolor paper (I also have one more card I shared HERE where I used the same technique and the same stamps, but student-grade watercolor paper and I can tell you that there is a huge difference, at least when you look at these in person), I then added a generous amount of water to the paper and started bringing color – yellow to one side of the flower and pink to the other mixing them in the center. 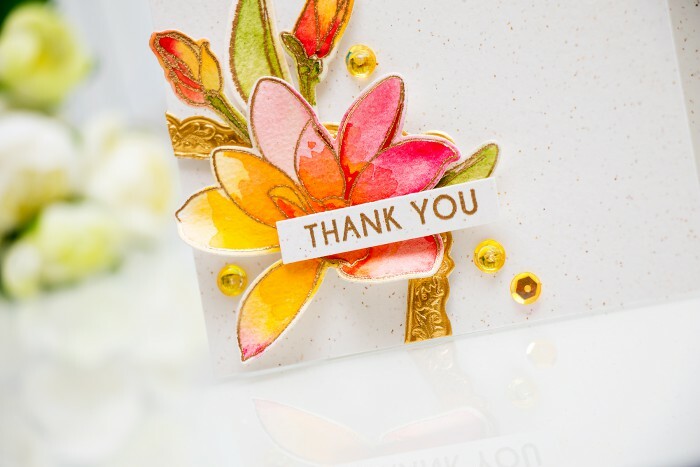 I used my heat tool to dry the image several times and layer more watercolor on top. Once my images were colored and dry I cut them out using matching dies (there isn’t a die for one of the leaves so I cut it out with my scissors). I also added physical dimension to the leaves and petals by shaping them with my fingers. To finish this card I foam mounted a partial Antique Trim Frame and adhered my colored images on top. 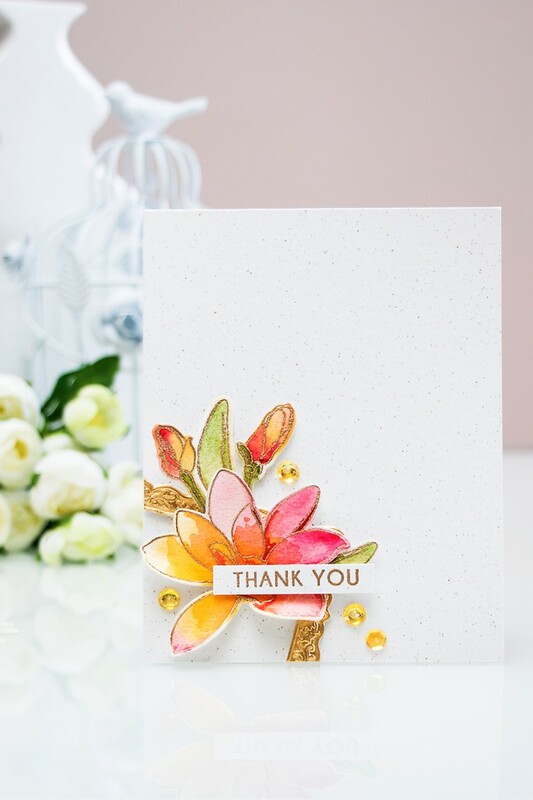 I also added a heat embossed Thank You sentiment and embellished the card with Sunshine Glow Sequins and Clear Droplets from Pretty Pink Posh. 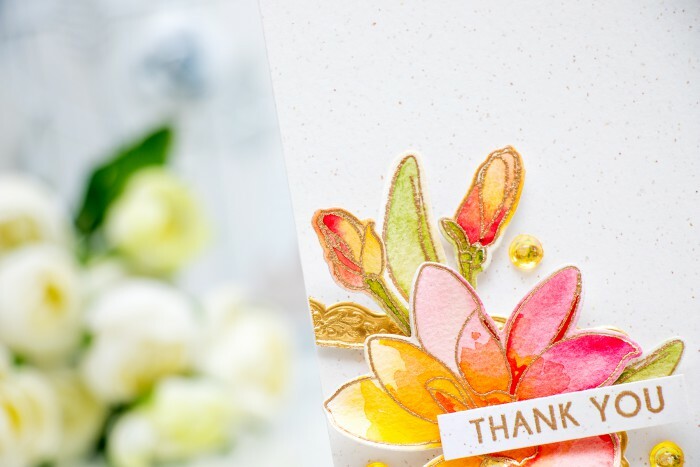 Yana, I absolutely love your work, it’s soooo good neat, colorful really right uptown.I show everyone I know your beautiful cards you get rave reviews from all of them!